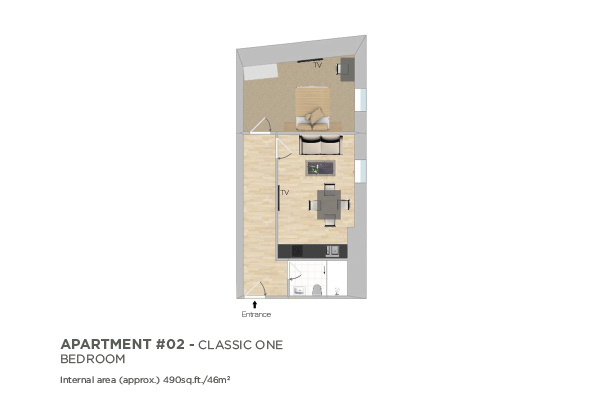 One bedroom residences at 1 Harrington Gardens are noticeably larger than studio apartments and offer the privacy of a separate bedroom aside from the lounge. Our one bed apartments are north and south facing, and vary in shape and layout with an overall size of 40–45 square metres. Like all our apartments the one bedroom residences have well-equipped kitchens with crockery, cutlery, glass and cookware provided. The apartment can accommodate an extra guest with the addition of a rollaway bed for the supplementary fee of £30 per night.